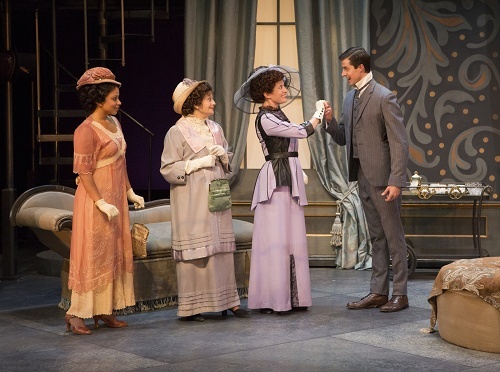 Pasadena’s Pygmalion: A Creation Worth Falling in Love With | That Awesome Theatre Blog! Written over a hundred years ago, George Bernard Shaw’s Pygmalion, playing now through April 12 at the Pasadena Playhouse, seems unlikely to be a relevant piece of theatre. You might think something so dated can’t be exciting. You would be wrong. Director Jessica Kubzansky has deftly and sumptuously reimagined the staging of the early 20th century masterpiece, and has actually brought it into the 21st century with wit, charm, and a surprising, but resounding spark of feminism.For those unfamiliar with Shaw’s work and only recognize the characters because of the hit musical My Fair Lady, which was a highly Hollywood-ized version of the original, should really see this production to see what the musical got really wrong. Poverty-stricken flower girl Eliza Doolittle (Paige Lindsey White), on a chance encounter, meets the insufferable Dr. Henry Higgins (Bruce Turk), an esteemed professor of phonetics, who makes a bet with his friend Col. Pickering (Stan Egi) that he can transform the foul-mouthed Eliza into a genteel and proper lady, which includes eradicating her of her lower-class cockney accent, and pass her off as a duchess. Eliza, who dreams of making such changes in her life so that she may someday open her own flower shop, agrees to the plan. Higgins then trains Eliza for months. Eliza’s first test comes at Mrs. Higgins (Mary Anne McGarry), Henry’s mother’s house. Eliza is to be presented to friends of Mrs. Higgins, to see if she can pass as a proper lady. Of course the experiment, in the plays most humorous scene, goes completely awry. The final trial, which is not actually seen, takes place at an ambassador’s party where Eliza succeeds in convincing everyone that she is, in fact, a duchess. Higgins and Pickering are so pleased with themselves that they seem to forget that Eliza has had anything to do with the success of the experiment. Eliza, hurt by their indifference to her, confronts Henry, and storms out. 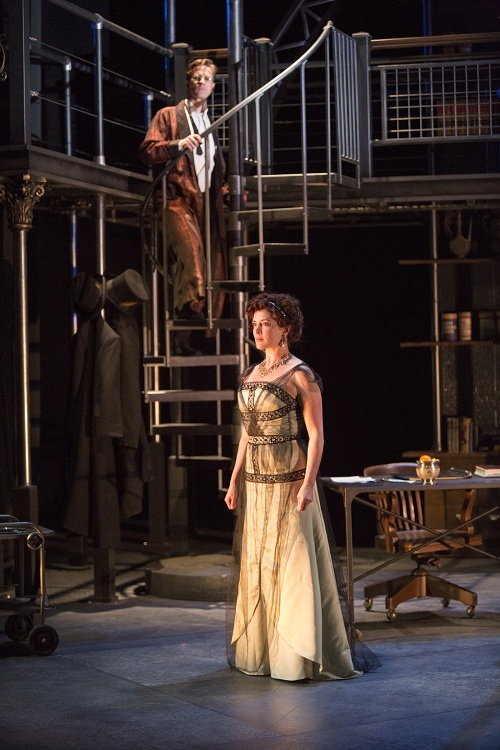 The final act of the play takes place in Mrs. Higgins’s home, where Eliza and Henry have a confrontation, culminating in a startling final moment. This production is vibrant and engrossing. At nearly three hours (with intermission) it moves like a dream, there is no excess, nothing that feels too long. And, in fact, the lengthy scenes between Henry and Eliza are so palpable with dramatic tension, and directed so flawlessly that they seem to make time stop. We are always right in on the action. Not an easy feat for a hundred year old play staged in a large theater. The tone of this production is immediate and glorious. We are completely transported to a different time and place. That is because of the absolutely gorgeous sets, designed by Stephanie Kerley Schwartz, the impeccable costumes by Leah Piehl, and spot-on lighting by Jaymi Lee Smith. The overall look of this production is exquisite. There is not a single misstep from anyone on the look and feel of this world. It’s just perfect. Director Jessica Kubzansky has done something magical here. She has created such an intimate feel to such a large production. She knows exactly how to heighten the theatricality of certain moments, and then bring scenes into such tight focus that the actors barely speak above a whisper. She plays upon the language of Shaw, and knows where to get the laughs, while at the same time manifesting the subtext with such acuity that this felt as relevant, dealing with virtue and beauty, as any contemporary story I’ve recently seen. It’s at once grand and quaint. A wondrous achievement. As Eliza, Paige Lindsey White is fierce. She nails it. And what is especially triumphant about this performance is the completeness of Eliza that she embodies. Playing such an iconic character comes with the added hurdle of having to make the audience forget the great women we’ve seen play this role. Ms. White does just that. Her Eliza is fully-fledged, strong, insecure, hilarious, and ultimately heroic. Her transformation throughout the play is less a device and more a necessity, and that is truly remarkable. Bruce Turk is equally compelling. His Henry Higgins is a bloviating bag of pompous hot air, and it is quite thrilling to see Eliza puncture him. However, he is more than his caustic dialogue makes him appear. And though his deft comic timing creates a larger-than-life self-importance in the man, his performance never goes too far. He is always reined in, and his outbursts ultimately make him human. This production never falters. The rest of the cast, without exception, is first-rate. Everything feels right about this. I was sorry it ended. This is such a beautiful reminder of what makes a classic play, truly classic. Of what artistry in the theater is capable of. It’s the perfect marriage of text, director, production team, and cast. It really, really, really, should not be missed.